Learn how to pre-allocate your attendees to breakout/optional sessions. Attendees can book an optional session from inside the event app or you can pre-book optional sessions for attendees directly from your app dashboard. Optional sessions will be used for booked sessions and attendance capacity can also be included. The capacity is to limit the attendance for each session. Event organisers need to import the attendees into the attendee list first, then they can add the attendees to a specific sessions. By pre-booking sessions for attendees from your app dashboard, the sessions will be automatically allocated in each attendee’s agenda (My Agenda) inside their app - no need for your attendees to book sessions. Before allocating sessions to your attendees you need to preload your attendee list. Once all your attendees are loaded you can allocate the attendees to the optional sessions they'll be attending. From your dashboard at your agenda you can download the optional sessions template and it will indicate all the optional sessions. Go to your agenda and select > Import Booked Attendees > Download template > Complete template by adding 'Y' for the attendee’s booked sessions > Upload booked attendees. *Please note row 1 and 2 of the template should not be modified. 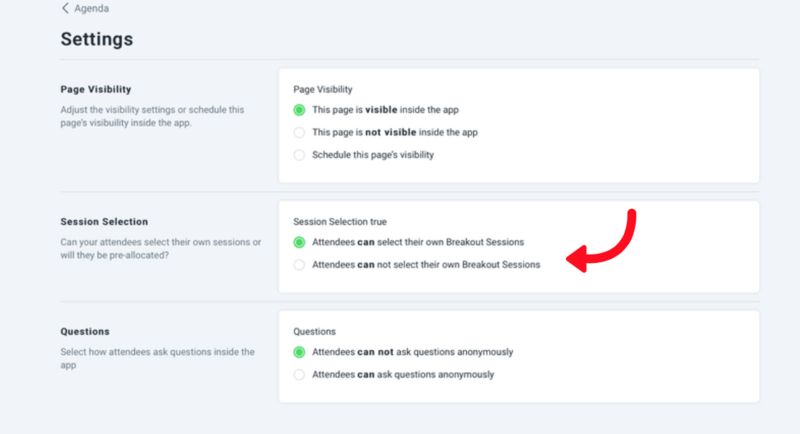 To enable or disable the option to select their own breakout session from your agenda select Settings > Session Selection > Choose your option.